So I meant to post this last night, but I had a super busy weekend...see next blog, and I went to bed super early last night. In my mommy's quest to keep me less tubular, she has implemented some new rules. First off, less food. I know I'm a pug, this rule must be broken and soon. Next rule, more exercise, which is fine with me I love going to the dog park. KONG only feeding, she says it takes me longer and burns calories at the same time. All this to keep me "at my peak". The next thing she has done is substitute some of my kibble with fruits and veggies. She had to do lots of research to make sure she didn't give me something I can't have or that will make me sick. So I'm totally digging carrots (I spy a little bitty bite in the background) but she just introduced me to something super duper yummers. Strawberries. I wasn't sure at first, but I really like them and the are sweet and yummy. Mommy says this is food that's good for me, but really it's all about what good in my belly! Geez, what's with our humans and their obsession with our tubey-ness!?! At least you're getting to try new foods though. I think carrots are superyummy too. Never had one of those berry things, but I did eat an orange the other night. My human thought I wouldn't like it but it was really tasty. Even Dutch like it and he is suuuuuper picky. Maybe you'd like them too? 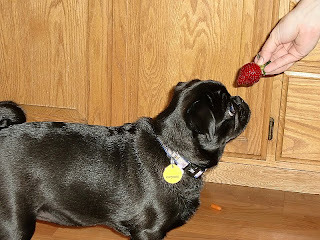 oohhh Puglet I am so going to try the orange. Whole Foods puts out lots of samples, so I might get to try a few new things next time mommy drags me there. I went to the vet on Saturday and I weighed a whole 26.5 pounds....now, I don't know what that exactly means but I've been hearing a lot more of the veggie and fruit words around this house. My mom tries to give me some of these veggies and I take them just amuse her and then spit them out in the back of the house. Except the apples, I like the apples. I like beef jerky more though..